Arctic, this ocean provides an important role in the climate system by transporting heat from the Southern Hemisphere and tropics into the Northern hemisphere. This transport helps to maintain the mean climate state. Variations in this heat transport can have important climatic impacts on a range of time scales, from inter annual to decadal to millennial. An important component of this heat transport is the Atlantic Meridional Overturning Circulation (AMOC). This circulation involves the northward movement of approximately 16-18 million cubic meters of water per second, with an associated heat transport of 1.3 Petawatts (one Petawatt = 1 million billion Watts). 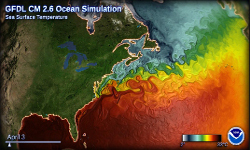 A crucial goal of climate research is to better understand the mechanisms responsible for interannual to decadal scale changes in the Atlantic Ocean, including the role of the AMOC as well as other important processes.